100% natural and contains no preservatives. A dry rub made with Jeremiah’s Pick Chocatal Coffee’s dark, hand-roasted Arabica coffee beans and cocoa nibs, the heart of the cocoa bean that imparts true chocolate taste. Gives meats, fish and poultry a unique smoky character and a delicious spicy crust. The arc of Jeremiah Pick’s life spans continents and professions. 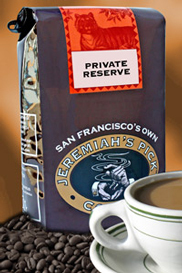 In an interesting way, it has all come together in his love affair with coffee and his specialty coffee business, Jeremiah’s Pick. Born and raised in a working class family in Tel Aviv, Israel, Jeremiah’s first passion was music, especially hand percussion, though the family’s limited financial means didn’t permit him to own an instrument at that time. He had applied to study in the United States and was accepted at Portland State University. He studied business, with a minor in filmmaking. At a pawnshop, h was able to buy bongos and congas and started playing. Jeremiah’s mother had been a “nose” for Helena Rubinstein Perfumes, and her palate for aromas and tastes has been inherited by Jeremiah and his two sons. It became evident that this was a huge asset. 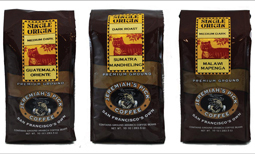 Selling coffee for Caffé Trieste gave Jeremiah a coffee education “on the run.” His enthusiasm and knowledge led to sales ranging from Safeway to McCormick & Schmidt Restaurants and Kimpton Hotels, convincing them that the quality of the coffee they served was important. Central to the entire business is Jeremiah’s motivation to provide affordable luxury, high quality beans at a competitive price. Many of the top gourmet independent supermarket groups are loyal customers, and Sprouts Markets has carried Jeremiah’s Pick Coffee since it began.